Welcome back for my last installment in our Small Business Month series. After months and months of planning, this May the Dell for Small Business team unveiled our “More than a PC” campaign. This campaign has a new focus! The ads feature real-life small biz customer, Skai Blue Media, with founder/ CEO, Rakia Reynolds at the helm of her fourteen-person team. Me, Erik Day (left) with Mario Delapena (right) – one of my team members who is featured in the latest Dell for Small Business ad campaign. 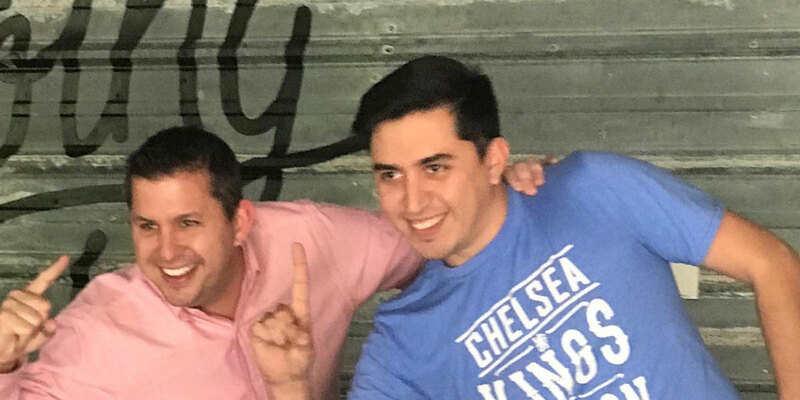 As the VP of Small Business, I oversee two hubs of small business sales advisors – one in Nashville, TN and one in Austin, TX. It is exciting to hear stories like that of Skai Blue Media and Mario. If you know me, you also know I am somewhat of a politics aficionado. Because of my affinity for public policy, I know small businesses are our countries economic backbone. We NEED small businesses to succeed so that ultimately our economy can prosper. One of the biggest challenges to small business success is picking the right IT. I am going to solve that challenge! That is why relationships like Skai Blue Media and Delapena are important. I want more small businesses to have dedicated technology sales advisors like Delapena to help them overcome or avoid altogether one of the most common impediments to small business success. Click here or call 1-800-BUY-DELL to find out how to get an IT sales advisor like Delapena. …relationships like Skai Blue Media and Delapena are so important. I did a Q&A with Delapena to find out about his newfound fame and see if that fame is going to his head! 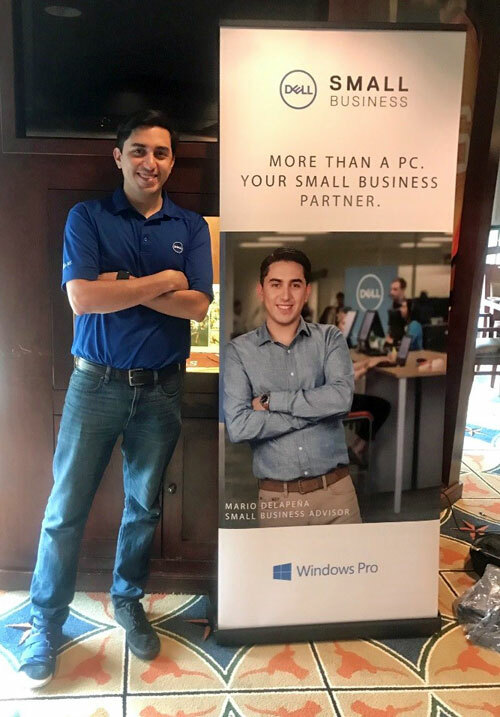 Mario DeLapena posing next to a poster of himself in the new Dell for Small Business national ad campaign. Erik: What did you think when you were picked to be in the national ad campaign? Mario: I thought, “It’s about time!” Just kidding! I felt honored. So many people attended the internal casting call on Dell’s campus. I didn’t think I would be the “chosen one”. When they told me it was going to be EVERYWHERE, I thought I had better call my family. I have been the first in my family to do many things. I called my mom and, sure enough, she was definitely more excited than I was. My mom was more excited than me. M: Just over two years. I was a university recruit from Texas Tech University. E: Why are you passionate about small businesses? M: It’s pretty cool to work with startups and small companies. You get involved with the people and build relationships and really friendships. You get involved with the people and build relationships and really friendships. It’s also pretty cool to watch those friends as they build and grow their companies. I see transformations from when I first start working with a small business to where they are now. The small business team at Dell has an infectious passion for bettering the small business world. As a leader on our team, I treat my job as if I am running my own SB, which, as any small business owner (SBO) will tell you, means I wear many hats. It also means I’m close to the action and the daily highs and lows of a business’s journey. E: What is your favorite part of your job? Besides working for me of course? M: I love the people I work with! There’s an idea that working in a corporate environment is stuffy and means you won’t like who you work with or can’t have fun at work. My experience is the exact opposite. My teammates here in the Austin, Texas office love to have fun. They also love to succeed, which makes for great competition (mostly friendly – HA!) and a readiness to celebrate each other’s victories. E: I know you are not forgetting the Nashville, TN teammates, right (nudge nudge)? M: Right! The Nashville team is awesome. I should visit them more. Will you send me to Nashville? E: NEXT QUESTION! What is the biggest IT challenge for small biz that your clients are telling you about right now? M: Preparing or reacting to this new age of technology, namely ransomware and cloud storage. Most SB’s do not have a dedicated IT department – and sometimes not even a dedicated IT PERSON. Therefore, IT decision making can be a side thought (or worse, an afterthought). Technology in this new age can be overwhelming. When you have no IT department, you’re hearing words like “ransomware” and “cloud storage” and you’re strapped for time because… DUH, you’re running a business. This causes some SBOs to dive into data security and cloud and more without a complete knowledge of what will work for their unique business. That’s where I come in. With Rakia and her team for example, I not only advise them on tech to buy, I help educate them on the best pathways to improve their IT space. Rakia and the rest of Skai Blue Media are fun to work with and it’s fulfilling to see how far their IT acumen has come over their years as a Dell customer. E: So, Is it weird seeing yourself on TV and in magazines? M: I have never been on TV before, but in my daydreams, I’ve always felt I might end up doing something like this. Not that I am destined for stardom and don’t look for me on the Hollywood walk of fame. Of course, the age of the meme makes it even better. My friends send me pictures of myself on TV or screenshots of the ads with hilarious captions so they are making memes of me. I get at least one per day. It’s become a thing. My friends send me pictures of myself on TV or screenshots of the ads with hilarious captions so basically they are making memes of me. E: If you could give one piece of advice to small businesses making IT decisions, what would it be? M: Even when it’s hard and you have a million other things on your plate, be proactive about IT. Rakia will tell you that I preach that to my customers all the time. I don’t want you to be the client who comes to me completely frazzled because something broke or something bad happened at a critical moment for his/her business (though I will still be glad to help you then). You want to be thinking about what comes next– or having your Dell small business sales advisor think about that for you – that’s where you want to be. Many people think it’s pricey to be proactive about IT. It’s true that it can require more of an initial investment than if you fly by the seat of your pants in IT decision making. But I have seen time and again, that those dollars come back around in the long term. Delapena appears in the new Dell for Small Business ad campaign, which includes video, print, billboards and more! You can get your own small business IT sales advisor by going to our website here or by calling 1-800-BUY-DELL.